Sport teams, scout groups, after school care, youth groups… make your end of year event one they will remember well into the new year! 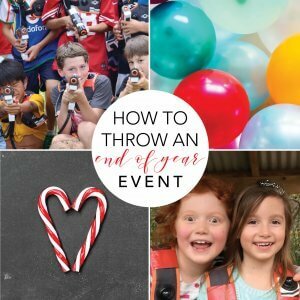 Here at LaserWarriors we have the perfect formula for throwing an AMAZING end of year party that will have kids and parents wowed! Give us a call ASAP and we can work with you to arrange the perfect day or night to hold your end of year event. We will work with you to decide on the right duration, number of games, participants, location and package to suit your needs. Kids love any excuse to get dressed up and in character… Go with a Christmas theme, crazy hair or bright colours. Otherwise some popular Laser Tag party themes are: Fortnite, Star Wars, Superheros, Commando. Take a look at our previous blog posts where we have great resources for themed parties. For the tween/teen age group our NightStalker add-on is a huge hit with smoke machine and lighting for an exciting night game experience. Keep it simple with pizza delivered or a simple sausage sizzle and fruit platters. The kids will also need lots of refreshments after running around during the Laser Tag games. Our staff will arrive on time and set up for the laser tag games. They will run the games for the set duration while you chat to parents and put out the food. Finish the year on a high with an event everyone will love! Give us a call today to discuss your end of year event.